" I highly appreciate New Zealand Government"
New Zealand Government gives training for guidance and counseling (BK) teachers and headmasters from all schools in Jakarta. This training is themed 'Training and Development for Public School Counselor'. The training is participated by 150 people and officially opened by Jakarta Vice Governor, Sandiaga Uno, and New Zealand Ambassador to Indonesia, Trevor Matheson, also attends it. He mentioned, it is realization of positive cooperation between New Zealand and Indonesia, especially Jakarta in building and developing education. "I highly appreciate New Zealand Government," he conveyed, at City Hall, Tuesday (5/8). It is hoped to encourage BK teachers to not only build student's character and personality, but also to polish their soft skills. 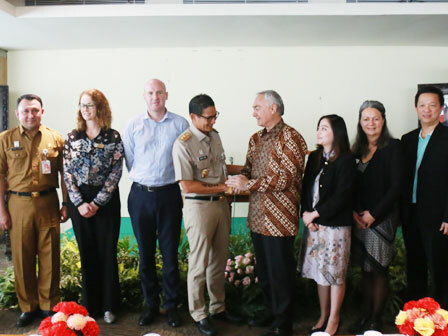 "New Zealand Education Team/Fortrust Education will give lesson and explain the importance of teacher roles in preparing Indonesia's next generation to reach better and advanced future," he affirmed. He hoped it could enhance quality of education and teachers, including BK teachers in high school and Madrasah Aliyah in Jakarta. "Teachers are hoped to have knowledge to build children from their early age to be a creative generation who understand of their potentials, have good moral, and strong will," he expressed. Similar to Sandi, Indonesia Market Manager for New Zealand Education, Karmela Christy also added, training is given to BK teachers and headmasters in order to point out the important of their roles in preparing Indonesian children to reach their future. "Hopefully this program is able to give new perspective, especially for them who have an important role in education," she affirmed.